A tremendous retreat for friends and family; this Waikoloa Fairway Villa is spread out over 1,600 square feet and features three bedrooms, three full bathrooms and accommodates up to six guests. Recently remodeled with beautiful wood tile flooring, quality bedding and beautiful appointments. The combination of classic and contemporary is handled masterfully in this "Beach-Themed" villa, and the open floor plan makes it easy entertaining family and friends. The living room is open and inviting and features comfortable furnishings and a large flat screen TV. 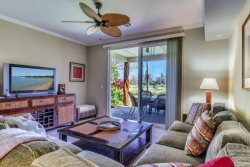 Adjacent to the living are is a covered dining lanai that features gorgeous views of the golf course and artistic patio furnishings. A fully-equipped gourmet kitchen comes stocked with high-end appliances and all the cookware needed to help create a delicious meal. The dining table seats six and the breakfast bar seats four. Upstairs is a beautiful master bedroom suite that features a king-size bed, flat screen TV and views of the golf course. The master bathroom is spacious and features a walk-in shower, deep-soaking bathtub and dual sinks. Two additional bedrooms; one is located on the upper-level and offers two twin beds and an attached bathroom, and the other is located on the lower level and offers a queen-size bed and is near the main bathroom. The unit is located near the Queens’ Marketplace and Kings’ Shops; complete with food court, art galleries, sushi, ice cream creamery, the Macaroni Grill, Island Gourmet Market, Starbucks, and many other shops, daily local entertainment, classes and cultural events. There is also a well-thought-out guidebook to the local area, complete with sections describing Waikoloa Beach Resort and all its offerings, important phone numbers, Big Island life information, a guide to beaches, shopping, activities, Luau/Dining, and Golf. You are within a 3-4 minute drive is famous Anaeho'omalu Bay (A-Bay) beach with all the joys of white sand, trees, snorkeling, and more. Further up the road (10 to 15-minute drive) are other local beaches.